It’s gorgeous, beautifully photographed and written, and oh-so-inspiring. I expected no less, but… this is still far more than I expected. Sherry’s work is breathtaking, and I love how she is inspiring bead artists to create their own vision, using techniques she explains. Beaders, don’t wait a minute longer, go get this! Read Sherry’s words and be inspired by her. Manifest your own vision in beads. Don’t try to be Sherry, because there is no one like Sherry. And we are so lucky to have her in our beading community! 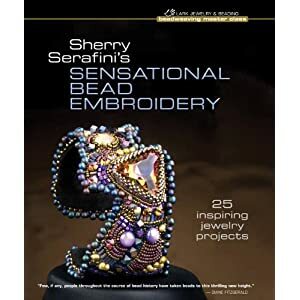 Step-by-step instructions for 25 dazzling bead-embroidered projects, all designed by Sherry, as well as a gallery featuring photos of additional work by the author and 8 other bead artists. Projects include the Shellz Earrings: worthy of a mermaid queen, these feature a shell held on with a peyote-stitch bezel, surrounded by keshi pearls, bugles and sequins and seed beads; and with a fringe of stick pearls at the bottom. These are a fun challenge to make because of the irregularity of the shape of shells. The Rays of Sunshine Freeform Cuff is a colorful, bohemian bracelet that incorporates glass and stone cabochons and large faceted beads on a substrate of bronze seed beads arranged in beautiful swirling patterns.